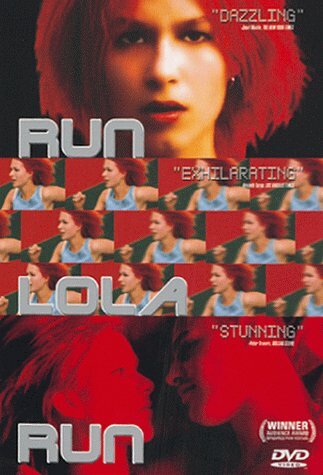 Run Lola Run is a movie about timing splinters (race conditions) where one action’s timing matters so much that getting it slightly different causes a cascade of reactions vastly different than the original expectation. Lola and her boyfriend Manni have 20 minutes to round up 100,000 marks or Manni will be killed by the mob boss the money belongs to. The whole 1 hour and 20 minute movie takes place in these 20 minutes, and yet never became dull or too repetitive. This film is a German film and the DVD started out in English dubbed mode. About 10 minutes in I was annoyed because they English speaking actors didn’t seem to emote very well and it made the movie seem weak. But I switched it into German language and English subtitles and the movie started shining. Don’t watch the English dub version of this movie or you will get a sub-standard experience! This film has many innovative devices. One that stands out is the flash-forward future clips that happen with certain otherwise unimportant side characters. Lola will pass someone—her primary mode of transportation is running since we learn in the opening scene that someone has stolen her scooter—and we will suddenly see still photos of the future of this person. These clips last only a second or so, but show comedy and tragedy of everyday people. Franka Potente (who is also in The Borne Identity) does a brilliant job as Lola, and shows great emotion as she encounters horrible secrets from her parents, the imminent death of her boyfriend and the strange luck of her day. This movie is really about the power of the love between Lola and Manni, how she will expend all her energy to help him stay alive.